CANNES, France, Oct. 16, 2018 — (PRNewswire) — iQIYI Inc. (NASDAQ : IQ ) ("iQIYI" or the "Company"), an innovative market-leading online entertainment service in China, today announced it has signed an agreement with Viacom International Media Networks (VIMN), a division of Viacom Inc. (NASDAQ: VIA, VIAB), to produce and distribute the second season of iQIYI's original animated children's series Deer Run. Viacom company Nickelodeon will assist in creative production of the show, which upon completion will air on Nickelodeon's international networks outside of China, with further opportunities for Deer Run's licensing potential outside of China to be explored. 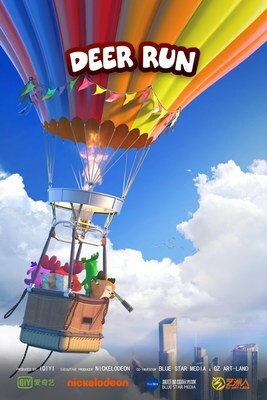 Deer Run is a 3D animated series geared toward preschool-age children, which presents the adventures of four cervine companions and the challenges they overcome. The renewed agreement follows the two companies' successful co-operation on the show's first season last year, which marked the first time an international media company acquired international distribution rights for a China-produced animated series. The first season is set to air in 2020. "iQIYI is excited to be partnering again with VIMN for another season of Deer Run," said Wang Xiaohui, Chief Content Officer at iQIYI. "The show's engaging plot is both entertaining and educational and we predict great things for this IP going forward. iQIYI is committed to producing outstanding original content and we will continue to work with talented partners to bring the best content to our users." "Deer Run, with its endearing and humorous storylines and compelling, relatable characters, proves that great original animation content can come from any part of the world," said Nina Hahn, Senior Vice President, International Production & Development, Nickelodeon. The expanded co-operation between iQIYI and VIMN was announced this week by representatives of both companies at an event during MIPCOM, a leading annual trade show held in Cannes, France. The announcement comes at a time of rapid growth in China's animation industry, the value of which exceeded RMB 100bn in 2016. Children's animation is considered by many to be an area of very high potential in the Chinese entertainment industry. Nickelodeon, now in its 39th year, is the number-one entertainment brand for kids. It has built a diverse, global business by putting kids first in everything it does. The company includes television programming and production in the United States and around the world, plus consumer products, digital, recreation, books and feature films. Nickelodeon is one of the most globally recognized and widely distributed multimedia entertainment brands for kids and family, with 1.2 billion cumulative subscriptions in more than 500 million households across 170+ countries and territories, via more than 100+ locally programmed channels and branded blocks. Outside of the United States, Nickelodeon is part of Viacom International Media Networks, a division of Viacom Inc. (NASDAQ: VIAB, VIA), one of the world's leading creators of programming and content across all media platforms. Nickelodeon and all related titles, characters and logos are trademarks of Viacom Inc.
Viacom International Media Networks (VIMN), a unit of Viacom Inc. (NASDAQ: VIAB, VIA), is comprised of many of the world's most popular multimedia entertainment brands, including MTV, MTV LIVE HD, Nickelodeon, Nick Jr., Comedy Central, Paramount Channel, and more. Viacom brands reach more than 3.8 billion cumulative subscribers in 180+ countries and territories via more than 200 locally programmed and operated TV channels and more than 550 digital media and mobile TV properties, in 40 languages. For more information about Viacom and its businesses, visit www.viacom.com.